It is the custom of the English Oratories, to conclude the Christmas Day celebrations with Benediction of the Blessed Sacrament. About 35 people turned out at 5pm for this short but beautiful act of adoration of our Our Lord in the Sacrament of his love. There was a short period of silence after which, was sung the hymn ‘ Adeste Fideles’ (O come, all ye faithful) which was written to be sung at Benediction on Christmas Day at St Edmund’s College, Ware, towards the end of the 18th century. At the end of the service, which lasted about 20 minutes, we sang the hymn ‘Sleep Holy Babe’, the words of which, were written by Fr Edward Caswall, a priest of the Birmingham Oratory and a companion of Blessed John Henry Newman. It is unusual in that addressing the Holy Child, we remind him that though he sleeps now, he will soon wake to the sorrows of life and his own particular Sufferings in the Passion. The final verse is addressed to our Blessed Lady. O Lady blest, Sweet Virgin, hear my cry. Forgive the wrong that I have done to thee in causing thy dear Son Upon the cross to die. 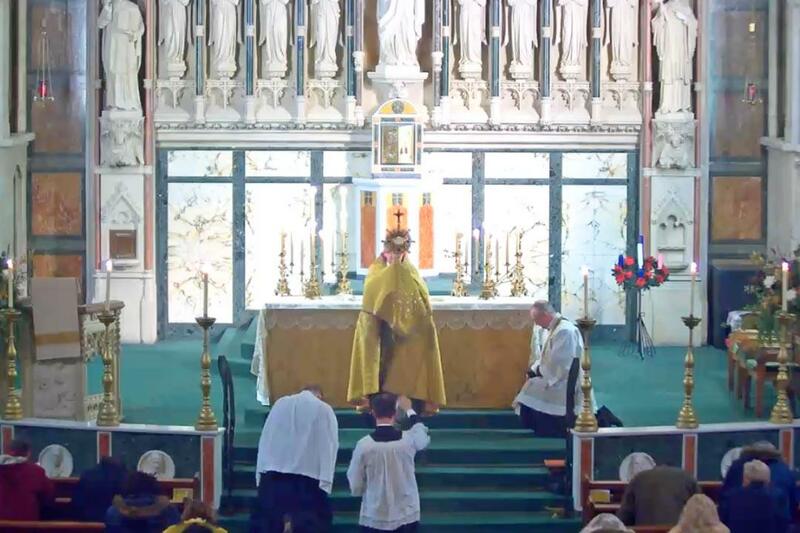 We have Benediction in our church every Sunday evening at 6pm. Do come and join us. BLESSED BE THE HOLY CHILD JESUS. NOW AND FOR EVERMORE.